We’d love to help your idea “stick” with your own customized temporary tat--be it veggie, fruit, acai bowl, or fermented goodie! We design one custom tat per job, which you can choose to pair with our existing designs. Make sure your deadline is at least two months out, so we have enough time to draft and edit your design to your satisfaction! Once we receive your design approval, we’ll need another five weeks for production, packaging, and shipping. Check out our order options and sizes and fill out the form below to get in touch about your project. 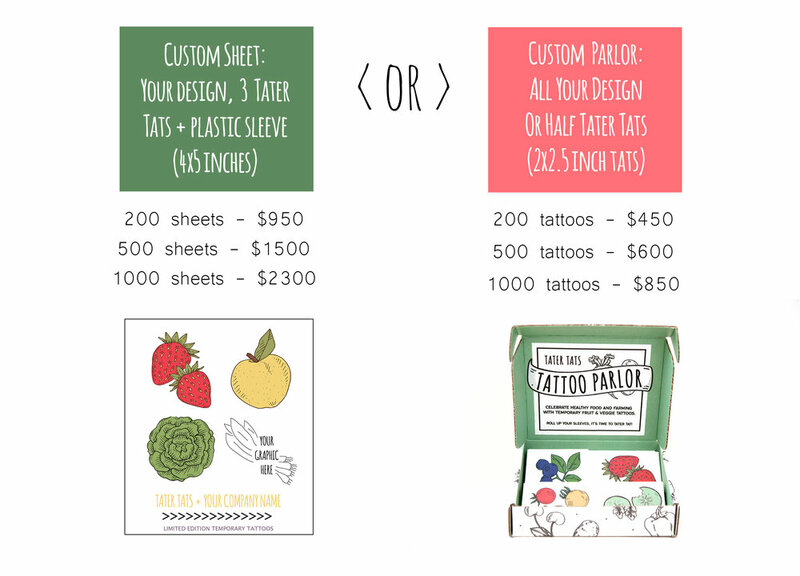 Custom Sheet: Choose the packaged sheet option--each 4x5 inch sheet includes 4 designs (your design+ three Tater Tats). These packaged sheets are great for including in swag bags, or wherever a loose tattoo might get lost in action. Sheets are co-branded at the bottom: Your Brand Name + Tater Tats. Custom Parlor: A Pop-Up Parlor stocked with your custom tats (or choose half custom and half Tater Tats). Great for events or giveaways, where recipients can use them right away. Comes with an applicator sponge and a banner. What will you be using your tattoos for? What graphic would you like for your tattoo? Please describe. If we go forward with your project, we will also need a few sample images. See options above and determine whether you'd like a party parlor or individual tattoo sheets. Please also let us know how many tattoos you'll need.